“If the Shia rebels gain control of the Bab al-Mandeb Strait, Iran can attain a foothold in this sensitive region giving access to the Red Sea and the Suez Canal, a cause of concern not only for its sworn rivals Saudi Arabia, Egypt and the Gulf states, but also for Israel and European countries along the Mediterranean.” — IDF Lt.-Col. (Ret.) Michael Segall. “Hard-line elements [in Iran] appear to see the continuation of the conflict [in Yemen] as a relatively low-cost and low-risk means of sustaining political, economic, and military pressure on the Saudis. Saudi Arabia’s intervention has reportedly cost between $5 billion and $6 billion a month, while Iran’s expenditures in Yemen probably total only millions a year.” — Gerald M. Feierstein, Middle East Institute. “The Houthis’ intransigence confirms their loyalty to Iran’s negotiating tactics. These usually begin with implicit approval of negotiating solutions, followed by complete retraction in order to force the international community to make more concessions and impose a fait accompli on the Yemeni government….” — Yemeni Foreign Minister Khaled al-Yemany. A ceasefire deal aimed at ending Yemen’s civil war is collapsing amid disputes between the warring parties over how to implement the agreement. A resumption of hostilities would, according to aid groups, accelerate Yemen’s descent into famine and threaten as many as 15 million people — more than half the population — with starvation. Yemen’s four-year conflict is generally viewed as a proxy war between Saudi Arabia, which backs the internationally-recognized Yemeni government, and Iran, which backs tribal-based Shiite rebels, known as Houthis. 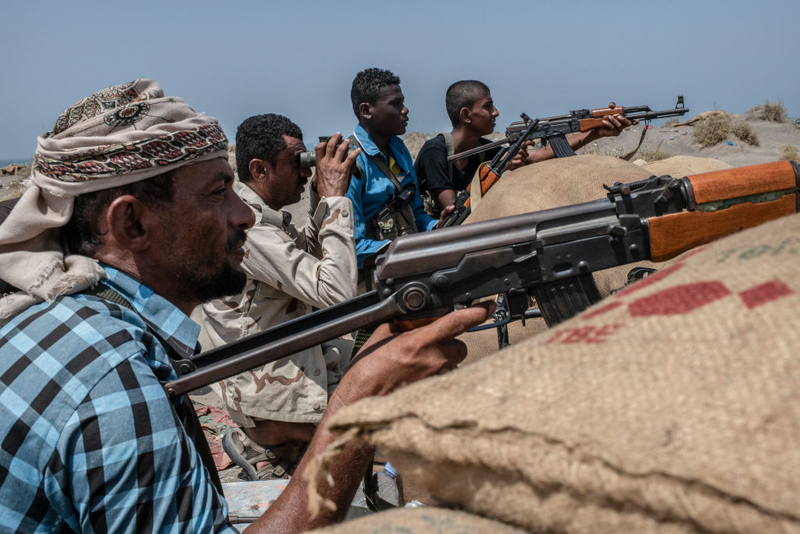 Iran has long denied accusations that it provides financial and military support to the Houthis, officially known as Ansar Allah (Partisans of Allah). According to the United Nations, however, Tehran has been supplying the rebels with weapons for more than a decade. Yemen’s civil war has deep roots based on religious, economic and political grievances that go back to September 1962, when a revolution replaced a 1,000-year-old absolute hereditary Shiite monarchy — the Zaidi imamate — with a secular regime, the Republic of Yemen. The Houthi movement, formed in 1992 as a Zaidi-Shia armed opposition group to fight the pro-American government of then-President Ali Abdullah Saleh, has demanded regional autonomy and a greater share of power in the central government. The Houthi insurgency began in June 2004, when the group’s leader, Hussein Badreddin al-Houthi, launched an armed rebellion aimed at bringing down the Saleh government. Sectarian violence was inflamed when al-Houthi was killed by Yemeni forces in September 2004. In November 2011, after more than three decades in power, Saleh signed a deal to transfer power to Yemeni Vice President Abdrabbuh Mansur Hadi. The move, welcomed by many as a turning point in Yemen’s history, failed to quell Houthi protests. The conflict escalated into a full-blown civil war in September 2014, when the rebels, representing between a quarter and a third of the Yemeni population, staged a coup d’état and seized control of the capital, Sanaa. Hadi, Yemen’s internationally-recognized president, subsequently fled to Saudi Arabia. In March 2015, Saudi Arabia and a Western-backed coalition of ten Sunni Arab states — alarmed by what they viewed as an attempt by Iran to establish a militarized Shiite state in northern Yemen — began a military intervention against Houthi targets to restore the legitimate government. The Saudi-led coalition, despite having superior air power, quickly got bogged down due to the Houthis’ adeptness at asymmetric warfare. The conflict soon reached a military stalemate that continues to this day. Sometimes called the “forgotten war,” the conflict in Yemen received new scrutiny after the October 2018 killing of Saudi dissident Jamal Khashoggi at the kingdom’s consulate in Istanbul. Outrage over the murder increased pressure on Saudi Arabia to seek a truce in Yemen. In November 2018, the United States announced that it was halting the aerial refueling of aircraft from the Saudi-led coalition engaged in Yemen. A month later, in December 2018, the United States Congress passed a joint resolution calling for the removal of American troops from Yemen. In March 2019, the U.S. Senate voted to remove U.S. troops from Yemen within 30 days. In April 2019, the U.S. House of Representatives passed a resolution to end American military support for the Saudi-led war in Yemen. The White House has vowed to veto the resolution. It has stated that the resolution raises “serious constitutional concerns” and is based on an “erroneous premise” — presumably meaning that it would not be in the U.S. interest to abandon Yemen to Iran. In December 2018, the warring parties signed a series of UN-sponsored agreements — known collectively as the Stockholm Agreement — primarily aimed at facilitating the movement of international aid through Yemen’s main Red Sea port of Hodeidah, through which the country receives about 70% of its food imports. The Houthis pledged to withdraw from Hodeidah and Saudi-led coalition forces promised to retreat from the outskirts of the city. The troop withdrawals in Hodeidah were intended to clear the way for wider negotiations to end the four-year war. The agreement, however, has been criticized for being ambiguous; it does not, for instance, stipulate who should control the port in Hodeidah after the Houthis withdraw. The Houthis now say that they will not withdraw from the port without guarantees that Saudi-led coalition forces will not seize control. Each side has accused the other of violating the pact. The Yemeni government believes that the Houthis are using the strategic port to smuggle in weapons from Iran to sustain their military efforts. Saudi Arabia views the Houthis — who adhere to Zaidi Islam, an offshoot of Shiism — as an Iranian proxy that Tehran is using to its project political and military power in the Arabian Peninsula in an apparent quest to become the dominant force in the Middle East. Saudi leaders have sounded the alarm about the threat posed by the so-called Shia Crescent, an ever-expanding arc of Iranian influence across the Arab world. In Iraq, for example, the government is now dominated by Shiites. In Syria, Iran (and Russia) have prevented Sunni rebels from overthrowing President Bashar al-Assad, whose Alawite sect derives from Shiism. In Lebanon, the Iran-sponsored Shiite terrorist group Hezbollah effectively runs the government. Now in Yemen, Riyadh seems justifiably to fear that Tehran is seeking to establish a permanent presence on Saudi Arabia’s southern border to encircle the Kingdom — possibly as part of a broader strategy to take control of Saudi oil fields and holy sites, Mecca and Medina — to upend the balance of power in the Middle East. “Iran also sees Yemen as an important factor in its policy of establishing a physical Iranian presence, both ground and naval, in the countries and ports of the Red Sea littoral, which control the shipping lanes that lead from the Persian Gulf to the heart of the Middle East and onward to Europe. Hussein Badreddin al-Houthi, the founder and chief ideologue of the Houthi movement, lived for a time in Qom, the main city in Iran for Shia religious studies, where he is said to have focused on the works of Ayatollah Ruhollah Khomeini, the leader of the Iranian revolution, who in 1979 transformed Iran into an Islamic theocracy. The Houthi movement’s anti-American and anti-Semitic slogan — “Allahu Akbar! Death to America! Death to Israel! Curse the Jews! Victory to Islam!” — appears to have been inspired by Khomeini, who had popularized the call for “Death to America” during the Iranian revolution. Iran has been shipping weapons to the Houthis since at least 2009, according to a 2015 report by a UN Panel of Experts. “Current military Iranian support to Houthis in Yemen is consistent with patterns of arms transfers going back to more than five years to date,” the UN report said. The UN document, presented to the Security Council’s Iran Sanctions Committee in June 2015, reported that in April 2009, an unnamed Iranian vessel unloaded crates of weapons onto Yemeni boats. The crates were then delivered in batches to the Saada Governate, where the Houthi movement is based. In October 2009, Yemeni authorities seized an Iranian ship, the Mahan 1, which was believed to be carrying weapons for the Houthis. In February 2011, Yemen authorities intercepted an Iranian fishing vessel in Yemeni territorial waters. The vessel was carrying “900 Iranian-made anti-tank and anti-helicopter rockets,” apparently intended for Houthi rebels. In June 2012, an Iranian ship, the Imdad 1, sailed from an Iranian military port in Bandar Abbas to Yemen. The vessel was carrying weapons, which were unloaded into small boats and taken to Ash Shirh, a small port in southern Yemen, and then delivered to Houthis in the Saada Governate. In January 2013, a joint US-Yemen patrol intercepted an Iranian ship, the Jihan 1, which was carrying 40 tons of weapons, including surface-to-air missiles, destined for Houthi insurgents. A UN Monitoring Report later indicated that some of the cargo may have been bound for al-Shabaab militants in Somalia. In March 2015, Tehran announced the beginning of an “air bridge” between Iran and Sanaa with a twice-daily shuttle service operated by Mahan Air, an Iranian government-controlled airline used by the IRGC Quds Force to ferry trainers and equipment to warzones. Hundreds of Hezbollah operatives, as well as members of the Iranian military, were said to have been transported from Yemen to Iran and back. In September 2015, the Australian Navy intercepted a dhow containing anti-tank guided munitions, tripods, launch tubes, launcher assembly units and missile guidance sets. The weapons were reportedly destined for Houthi rebels in Yemen. In February 2016, Saudi Arabia stopped a ship that was carrying military communications equipment under the guise of carrying medical supplies. The vessel, which was on its way to Houthi rebels in Yemen, began its journey in the southern Iranian port of Bandar Abbas. Also that month, the Australian Navy intercepted a dhow that was carrying 2,000 AK-47s, 100 RPG launchers, and other weapons. In March 2016, U.S. Navy ships in the Arabian Sea seized an arms shipment from Iran likely bound for Houthi fighters. The weapons seized were hidden on a small dhow and included 1,500 AK-47 rifles, 200 rocket-propelled grenade launchers, and 21 machine guns. Also that month, a French destroyer seized almost 2,000 AK-47s, dozens of Dragunov sniper rifles, nine antitank missiles, and other equipment. In October 2016, Reuters reported that Iran had increased weapons transfers to the Houthis through Oman, which neighbors Yemen. In November 2017, Houthi rebels launched a missile strike at the Saudi capital Riyadh, targeting King Khalid International Airport. The missile used was a Burkan-2, which is based on the Iranian Qiam ballistic missile. The attack demonstrated that the Houthis were capable of reaching deep into Saudi territory. On March 25, 2018, Saudi air defenses intercepted seven ballistic missiles fired by Houthi rebels at Riyadh, where one man was killed from debris, as well as at the southern cities of Najran, Jizan and Khamis Mushait. Two weeks later, on April 11, 2018, Saudi air defense forces intercepted a ballistic missile over Riyadh. Houthi media outlets said that the missile was targeted at the Saudi defense ministry. In July 2018, Houthi leaders reportedly ordered their followers and loyalists in rebel-controlled government institutions, including schools and universities, to organize seminars and events to commemorate the Iranian Revolution. The streets of Sanaa were decorated with posters encouraging the people to repeat Khomeini chants. The rebels also dispatched convoys mounted with loudspeakers to broadcast recordings by Houthi founder, Hussein al-Houthi, and his brother and their current leader, Abdul Malek. In November 2018, the US special representative for Iran, Brian Hook, provided evidence of Iranian missile proliferation to Yemen. He showed the remains of Sayyad-2C surface-to-air missile intercepted in Yemen by Saudi Arabia. The missile, emblazoned with the words “The Hunter Missile” in Farsi, was evidently intended for the Houthis. Hook said that Iran also is exporting antitank guided missiles: Toophan missiles were seized aboard a dhow ship in the Persian Gulf, and Towsan missiles were found by Saudi Arabia during a raid in Yemen. In January 2019, Houthi rebels used an Iranian-supplied drone to attack a pro-government military parade at the Al-Anad military base. Yemen’s chief of military intelligence, Major General Mohammad Saleh Tamah, and the Yemeni army’s deputy chief of staff, Major General Saleh Al-Zindani, died of wounds sustained in the attack. The attack proved Iran’s role in arming the rebels with drone and ballistic missile technology. In March 2019, Saudi-led coalition forces reported that during the month they had shot down four Iranian-supplied drones. In addition to direct support from Iran, Houthi rebels are also receiving help from the Iranian proxy, Hezbollah. In 2014, for instance, several Hezbollah operatives were arrested in Yemen and held on charges of training Houthi rebels. The men were members of Hezbollah’s Unit 3800, an expeditionary militia modelled on the Iranian Quds Force and aimed at spreading Iran’s revolution to other countries. Earlier, in August 2013, the U.S. Department of the Treasury had sanctioned a former Hezbollah commander, Khalil Harb, for his command of Hezbollah activities in Yemen from 2012 onward. Harb had been found responsible for the movement of “large amounts of currency” to Yemen. Hezbollah also helped the Houthis establish their first satellite television channel, Al Masirah TV, which is based in Beirut’s Hezbollah-controlled southern suburbs. Also that month, the Saudi Arabia-owned Al Arabiya news network posted a video of what it claimed was a meeting between Hezbollah commander Abu Saleh and Houthi forces in Yemen. The video shows a man in military fatigues addressing a group in Lebanese-accented Arabic about training for “martyrdom” operations inside Saudi Arabia. In August 2018, Hezbollah revealed that its leader, Hassan Nasrallah, had met with a delegation headed by Houthi spokesman Mohamad Abdelsalam to discuss the war in Yemen. Although questions remain about the degree to which Iran can control or influence Houthi behavior, the ongoing war in Yemen has increased the Houthis dependence on weapons and financial support from Iran, whose position in Yemen is stronger than ever. Since the October 2018 murder of Saudi dissident Jamal Khashoggi in Istanbul, the tide of world opinion has turned against Saudi Arabia — a turn of events Iran will be sure to exploit. Even if the warring sides eventually reach a peace agreement, Iran’s presence in Yemen is unlikely to diminish anytime soon. This entry was posted on April 11, 2019 at 7:43 PM and is filed under Uncategorized. You can subscribe via RSS 2.0 feed to this post's comments. You can skip to the end and leave a response. Pinging is currently not allowed.